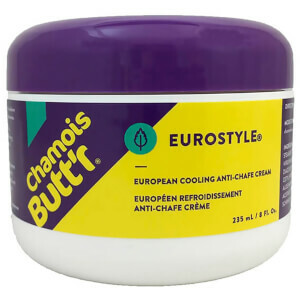 Boasting a creamy yet non-greasy formula, Chamois Buttr Eurostyle Hot Embrocation Cream will help to warm your muscles ready for cycling, making it ideal in cold weather. Providing a protective layer over exposed skin, it will also help to protect you from the elements. - L.M. I love it. It is useful when it's about 5-10 degrees celcius outside. This cream is a very good help for that cold days that you have skin exposed, i recommend using it in the warmup this cream washes off your hands nicely and produces a good temperature isn´t that extreme hot like others I have tested that almost make your skin burn, this one doesn´t turn your skin reddish. Just caution when you go to the shower because the water that touches the parts with cream will become very very hot.